God arises. His enemies scatter, and those who hate Him flee from His presence. We are beginning to experience a move of God. I wondered about that term we use, "move of God". This idea contradicts the notion that God is fixed and static. But the idea captured in Psalm 68:1 is of The King standing up, from his throne. The immediate affect of God moving is his enemies scattering. When God comes, the enemy has to go. Much of the good that happens when God moves, is all the bad that has to go. There is a war that has been going on, since the beginning of time, between God and his enemy. The enemy has taken territory, and when God moves into that area, the enemy scatters and flees. People who make friends with the enemy of God become God's enemies as well. In the New Testament, we are told by James that becoming a friend of the world makes us enemies of God (James 4:4), and John tells us that we are not to love the world nor the things of the world and if we do, we do not have Father's love in us (1 John 2:15). We learn that there is a serious distinction between loving people who live in this world, and loving just "the world". The bad side of the world, that we are to avoid is the desires and pride in the world (1 Jn 2:16). The world has been the battlefield, with people as targets and captives of God's enemy, since the beginning. The way that the enemy lures and captures people is first demonstrated with Adam and Eve; when the serpent tempted them to fall. Since that time, men and women have been falling into the enemy's traps and becoming captive. But, God has been on the move and has had a plan to crush the enemy, which God did in Christ (Gen. 3:15). We know that the reason Jesus Christ came was to destroy the works of the Devil (1 Jn. 3:8). And those evil works are all the wrecked lives that God redeems in Christ. This is Power Evangelism. Notice that the power is first, then comes the good news. When God moves, there is power released. That power brings deliverance, healing, and salvation. The work of salvation was finished on the cross, but we are seeing salvation appropriated into lives when they come into contact with the living God. This same God is the God that David and the Israelites looked to, in the Old Testament times, back to Moses, and through the Prophets. Back to the idea or concept of the move or moving of God. The first time we see God moving, in scripture is in Genesis 1:2, when it says that the Spirit of God was hovering over the surface of the earth's waters. The King James Bible has it written, that the Spirit of God moved on the surface of the waters. This is our "proof text" of God moving. You might have heard or noticed that in "moves of God", which have also been called revivals, awakenings, or visitations; that people's bodies react. We fall, we shake, we cry, we cry out, and even do acrobatics. This is perfectly natural that human bodies are going to react in the presence of God. God is omnipresent. God is everywhere and sees everything. But there is a manifest presence of God, when God draws near, comes, visits, dwells, and moves. Even though it was in the Old Covenant times, we see this phenomenological dynamic with God on the mountain in Exodus. God met with Moses and wanted to meet with everybody, up on the mountain. God, being God, is and was omnipresent, but on the mountain, he was manifestly present. The same principal holds true today, that God can move to be more present or increased in presence. We say, "Come, Holy Spirit", and we are inviting God to come more. He is already here, but we are asking God to increase his presence. When we say, "Let it come", we are are speaking with the authority of Christ, to make or give an authorization for God's power to manifest among people in a space. "Let it come", is not a command to God, but an announcement, command, and invitation to people, to the natural realm, and to the demonic, if they are present; to let the power and presence of God come. It would be like a police officer saying, "Make way", because someone is about to come through. The same authority that Jesus gave to the original disciples (Matt. 10:1, Luke 9:1), he gives to all of us through the great commission (Matt. 28:18-20). God comes and God moves and there is an increase in God's activity through the authority given to the church, which are the people of God. And that authority is over the works of the devil, which includes demonic activity and all sicknesses. When God moves, people get saved, healed, and delivered; and often healed and delivered before saved; which we call power evangelism. Evangelism still goes on, even when there is not a move of God, because the good news is always true and is powerful. But during the moves of God, like some are starting to experience: when God draws nearer, and when God moves, the enemy flees easier. The enemy flees from Christians always, but we are not always walking in the same degree of power, from God, which makes it harder to make the enemy flee. Remember the story of when the disciples could not get an exorcism finished, and Jesus remarked, "This kind does not come out, but by prayer and fasting"(Matt. 17:21)? They needed more power and fasting increases or multiplies prayer power. and those who hate Him flee from His presence. so You blow them away. they rejoice before God and celebrate with joy. His name is Yahweh—and rejoice before Him. and a champion of widows. but the rebellious live in a scorched land. You revived Your inheritance when it languished. God, You provided for the poor by Your goodness. She who stays at home divides the spoil. and its feathers with glistening gold. Mount Bashan is a mountain of many peaks. at the mountain God desired for His dwelling? as He was at Sinai. so that the Lord God might live there. and escape from death belongs to the Lord God. the hairy head of one who goes on in his guilty acts. my King, in the sanctuary. praise the Lord from the fountain of Israel. the rulers of Zebulun, the rulers of Naphtali. Your God has decreed your strength. You who have acted on our behalf. kings will bring tribute to You. Trample underfoot those with bars of silver. Scatter the peoples who take pleasure in war. Cush will stretch out its hands to God. to Him who rides in the ancient, highest heavens. Look, He thunders with His powerful voice! 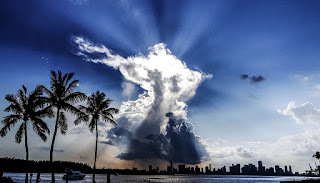 His power among the clouds.